Amazon Prime Video comes to EEYour train ride home just got a lot more interesting. We’re providing EE customers with six months of Prime Video on us, so you can catch the whole of The Grand Tour on your daily commute. And with 4G in more places than any other UK network, you can stay entertained almost anywhere. We'll even cover the data you use to watch it on your phone. And if Clarkson, May and Hammond don’t float your powerboat, no worries - there’s loads of box sets, movies and award-winning exclusives to enjoy, including The Marvelous Mrs Maisel, Tom Clancy's Jack Ryan, The Man in the High Castle, Vikings and many more. 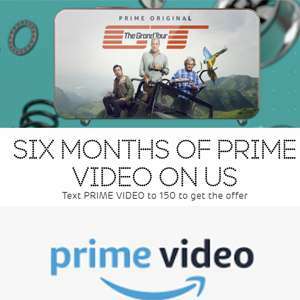 Text PRIME VIDEO to 150 to get the offer. Hi everyone. My name is AJ, I work in EE’s social media team and I came across this thread. It’s great to see that people are excited about our new offers. I wanted to make sure everyone in this thread has the correct information on this new offer. If you cancel either offer during the 6 month offer period, it will cancel almost instantly and you won’t get the full 6 months of access. You’d then be unable to sign-up for the offer again. You can find out more information about how the offers work at ee.co.uk/hel…-ee and ee.co.uk/hel…-ee. Do I have to be on a train to be eligible? Heat! but i cant live without my prime deliveries. Only covers prime …Heat! but i cant live without my prime deliveries. Only covers prime video. So will give it a miss for now! Wish they'd do this for Netflix. I have prime already (good they are covering the data usage also - so might be worth adding another account just for that). Heat added - great deal for those wanting to get prime. If you cancel straight away will the subscription still run its course for the 6 months then expire upon renewal? Heat! but i cant live without my prime deliveries. Only covers prime video. So will give it a miss for now! Is this just available to watch on a phone? Pay monthly customers can now get free six-month subscriptions to the services included in their plan, EE says. The offer comes with inclusive data, so customers can watch the content while they are out and about, or not connected to WiFi, without using any of their monthly data allowance. Marc Allera, chief executive of BT's consumer division - which owns EE - said: "It's our ambition to offer our customers unrivalled choice, with the best content, smartest devices, and the latest technology through partnerships with the world's best content providers. "In offering all EE pay monthly mobile customers Amazon Prime Video and MTV Play access, in addition to BT Sport and Apple Music - we're providing them with a wealth of great entertainment they can experience in more places thanks to our superfast 4G network, and soon to be launched 5G service. Great find but I’ve no idea about Amazon video so have a few questions. Will this only work via mobile as I have Sky Q is they a app for Amazon tv? I also have a Now TV box will it work on that? Can I cancel straight away so no costs occurred after the free 6 months? Does this effect my EE sim only contract in anyway? Is it just EE contract i guess rather than PAYG? I assume you can cancel straight away after signing up? You cancel it on your EE account. Looks like sky Q doesn't have an amazon app so that's out. Same for the Now TV box last I checked. You can use it on other devices though it seems. You just need something that has the prime app - iPhone etc, android, fire tv stick, games console. 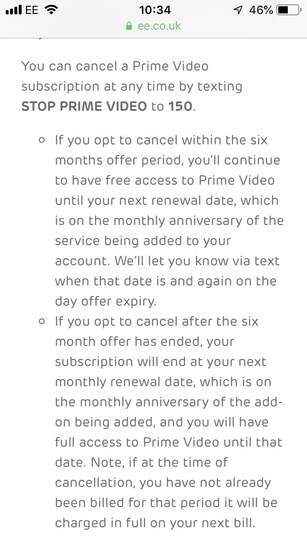 Just login to the amazon account and cancel auto renew, you'll get 6 months free but won't be charged after (that's the usual way to do it anyway). Can't comment on the EE sim bit but I'd imagine it won't affect it at all, negatively anyway. Looks like sky Q doesn't have an amazon app so that's out. Same for the …Looks like sky Q doesn't have an amazon app so that's out. Same for the Now TV box last I checked.You can use it on other devices though it seems. You just need something that has the prime app - iPhone etc, android, fire tv stick, games console.Just login to the amazon account and cancel auto renew, you'll get 6 months free but won't be charged after (that's the usual way to do it anyway).Can't comment on the EE sim bit but I'd imagine it won't affect it at all, negatively anyway. This for pay as you go as well? Anyone know how to log in to prime on your TV from this deal? Is it your ee account or what? Anyone know how to log in to prime on your TV from this deal? Is it your …Anyone know how to log in to prime on your TV from this deal? Is it your ee account or what? I pay £9 (probably £10 after rpi rise) for unlim texts calls 4gb data on EE. Think its turned into a rolling contract now as they didnt offer anything cheaper. Are you texting amazon prime instead of PRIME VIDEO ? No, although I am a business customer. Worthwhile I'd say even for those with Amazon Prime already - as the data used to consume Amazon streaming content is free (based on the blurb above).